My favorite crawfish dish. In fact, it may be one of my all time favorite dishes. Looks good, too! Right now, it’s the height of crawfish season. Crawfish season runs from mid-February through June. Crawfish season changes from year to year, and is dependent primarily on water levels in Louisiana’s Atchafalaya River Basin where 90 to 95 % of the annual U.S. crawfish production comes from. Interestingly, but not surprisingly, rice fields and crawfish farms typically operate as one. Regardless, if you love crawfish then this is the season where your living the good life. Crawfish boils are happening and good times are being had at crawfish festivals. Crawfish are such a wonderful, delicate dish despite their somewhat demonic appearance. The only problem I have with crawfish is it takes a lot of them to make a meal. 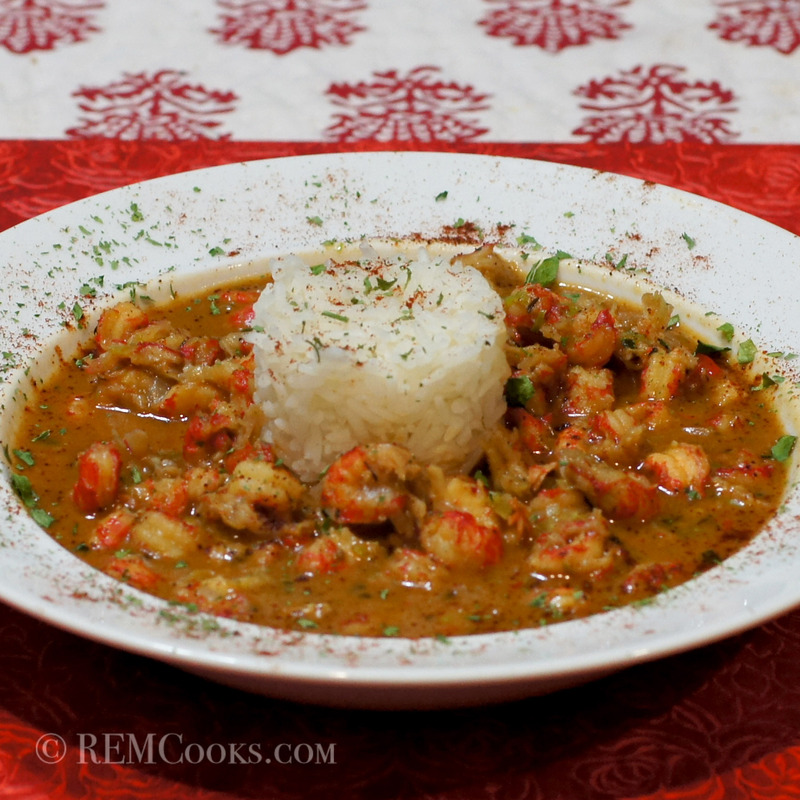 I love them in a crawfish boil and don’t mind peeling and eating them but for dishes such as crawfish étouffée, I generally buy prepackaged, cleaned and frozen crawfish tail meat. You’re obviously losing some flavor but I simply cannot sit down and peel crawfish without eating them, a lot of them. 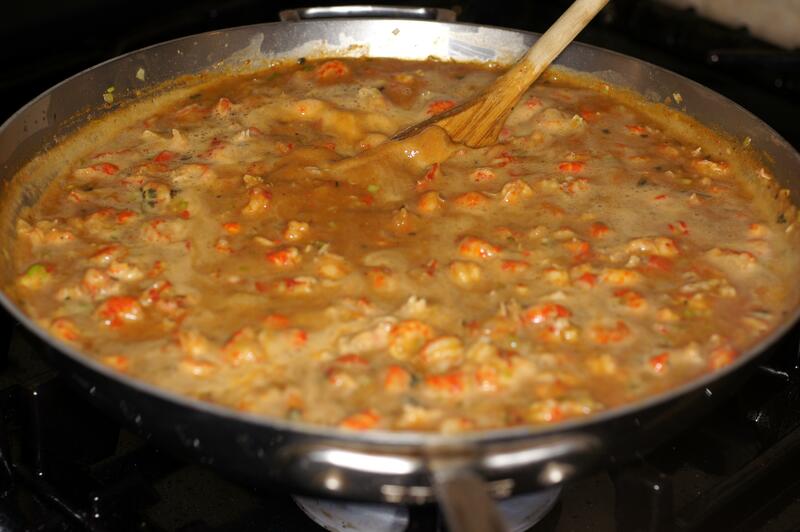 It never fails that I don’t have enough crawfish leftover to make étouffée. 😮 They really are one of my great weaknesses. 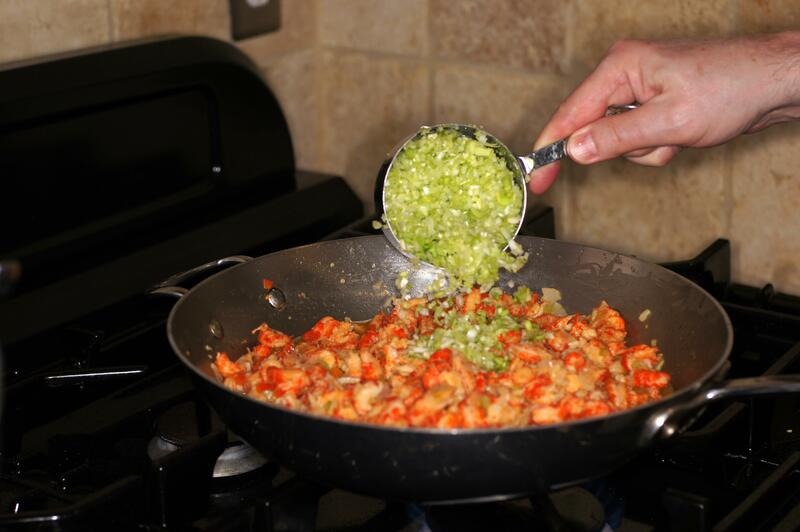 So, in celebration of crawfish season, we made this dish and it’s wonderful. We hope you give it a try. 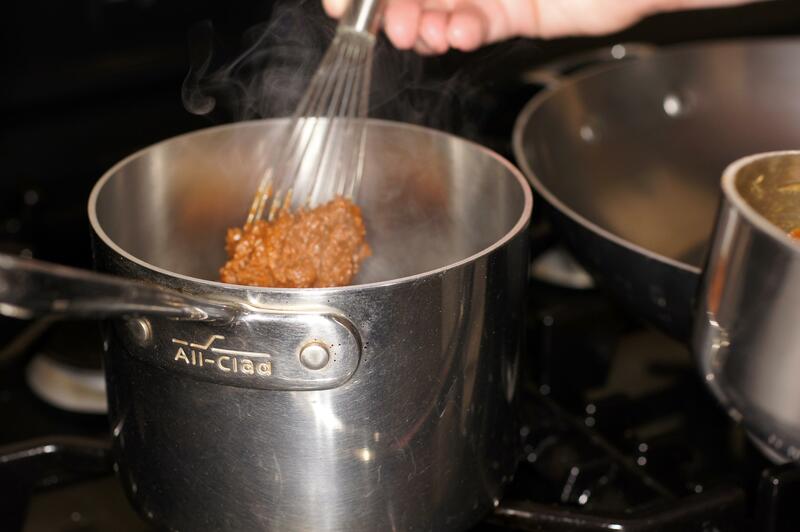 Always, first thing first, make a brown roux by combining the flour and the oil in a small saucepan. Place in a 450 F oven and ignore for 1 hour. 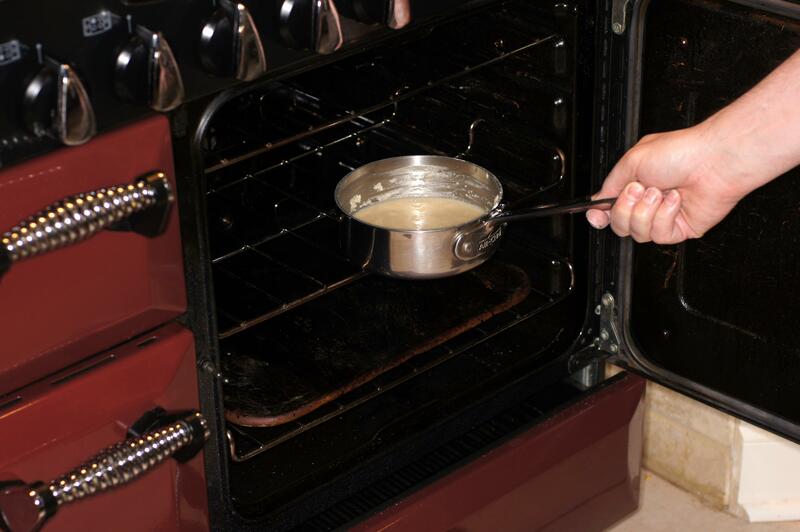 Now, you could painstakingly stand over the stove and relentlessly whisk the roux while cooking over low heat so as to brown and not burn the flour. But why would you when you get these results using the oven with little to no risk burning the flour. 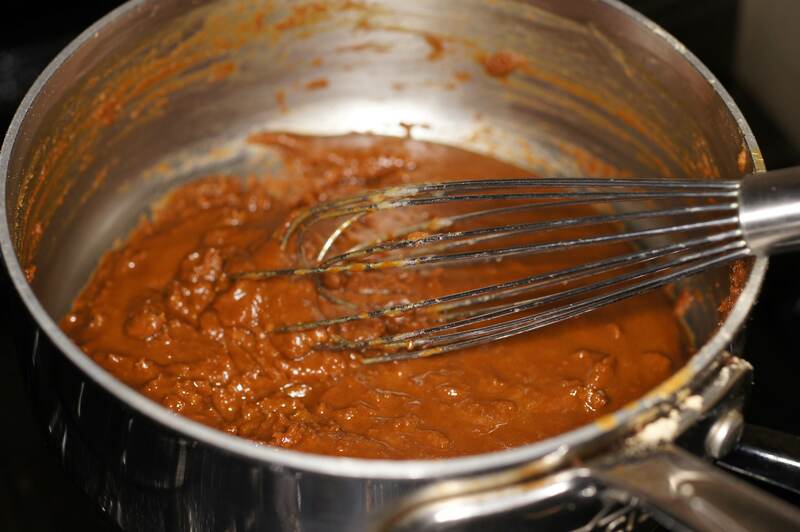 Look how beautifully brown this roux got. 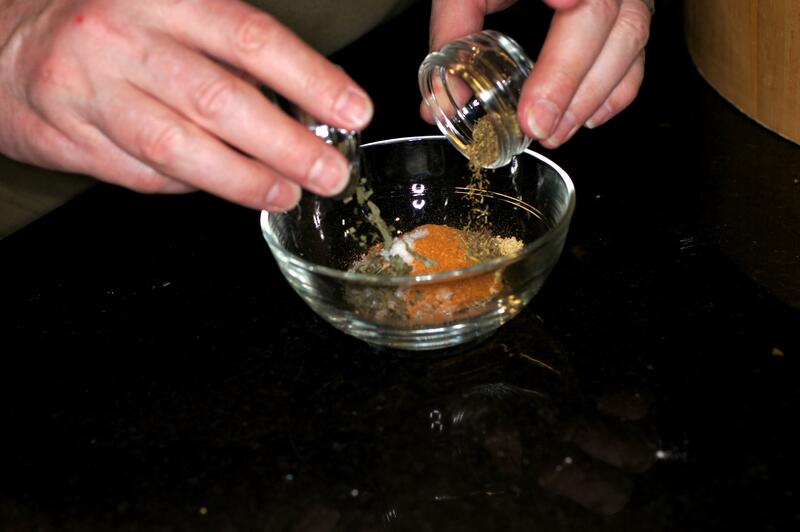 While the roux is cooking, mix the spices in a small bowl and set aside until needed. Because of the small amount of oil in the roux, it’s very thick. In fact, it’s too thick to sauté the vegetables. 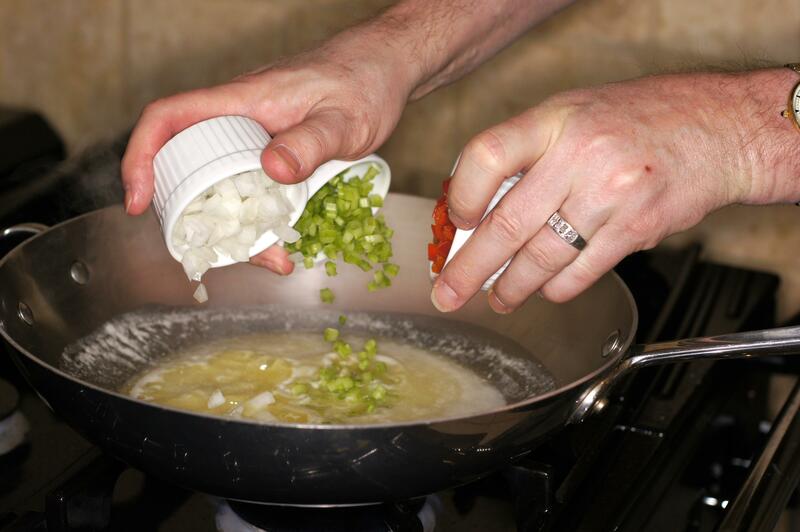 If you want to sauté the vegetables in the roux, then use equal parts flour and oil. 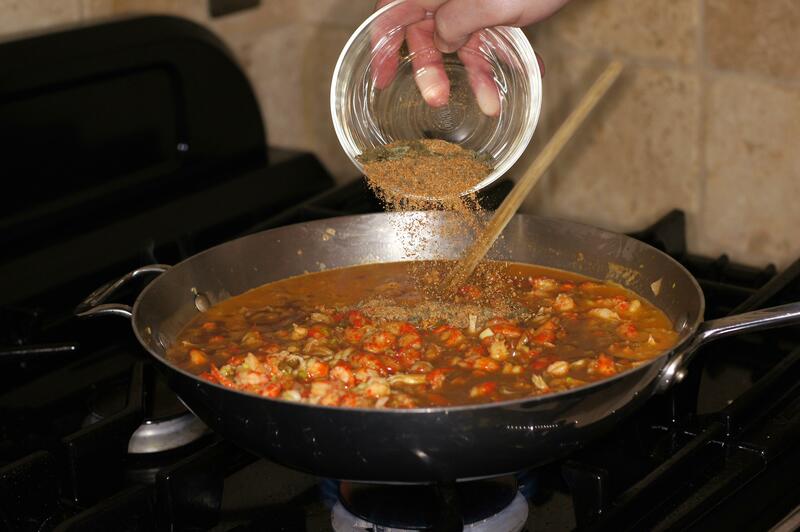 Because we did not sauté the vegetables in the roux, we added the roux to the shrimp stock and created the base sauce for the étouffée. 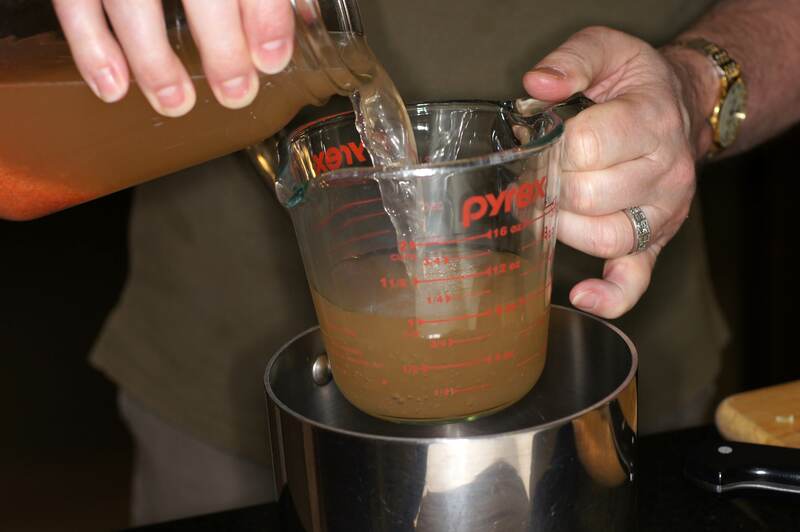 So, measure out 3 cups of stock and pour into a sauce pot. Now, to tighten a sauce, one of the ingredients must be hot and the other must be warm. If both are hot, the sauce will lump. 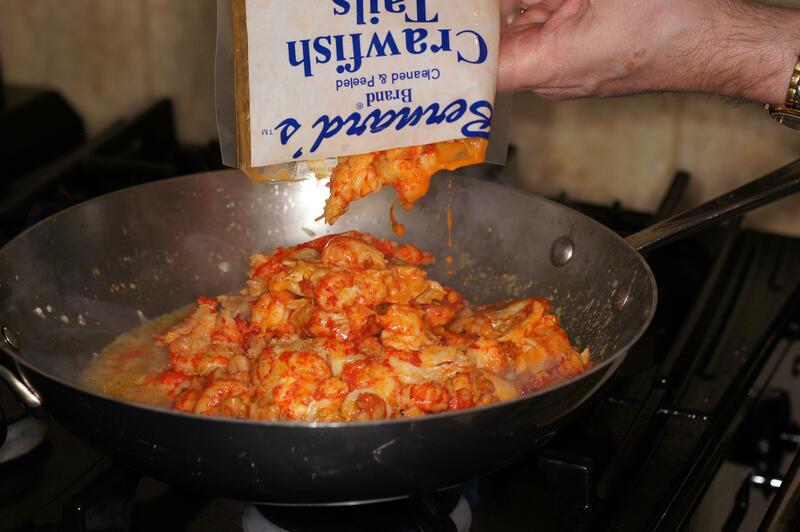 Because the roux was still very hot, we used warm shrimp stock. 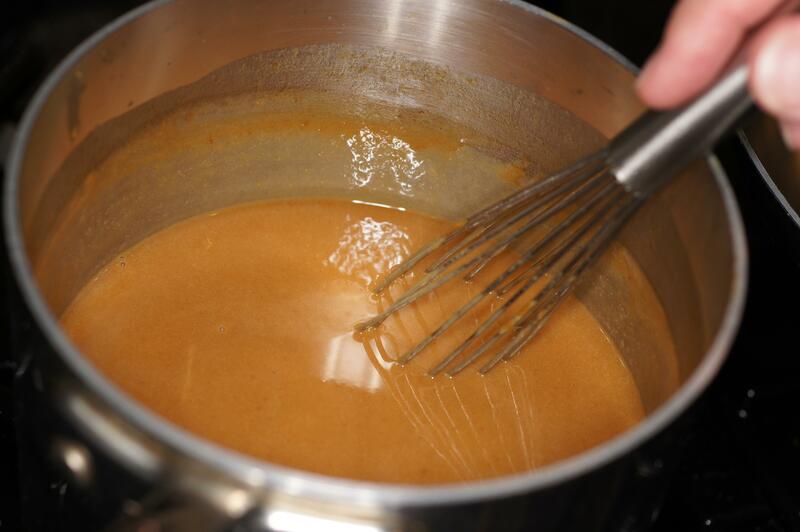 Add the hot roux to the stock in small quantities whisking constantly. Cook over medium low heat, stirring constantly so as not to scorch the flour, for 2 – 3 minutes or until the flour taste is gone. When finished you will get a base sauce like this. Remove from heat, cover and set aside. Now, let’s sauté the veggies. 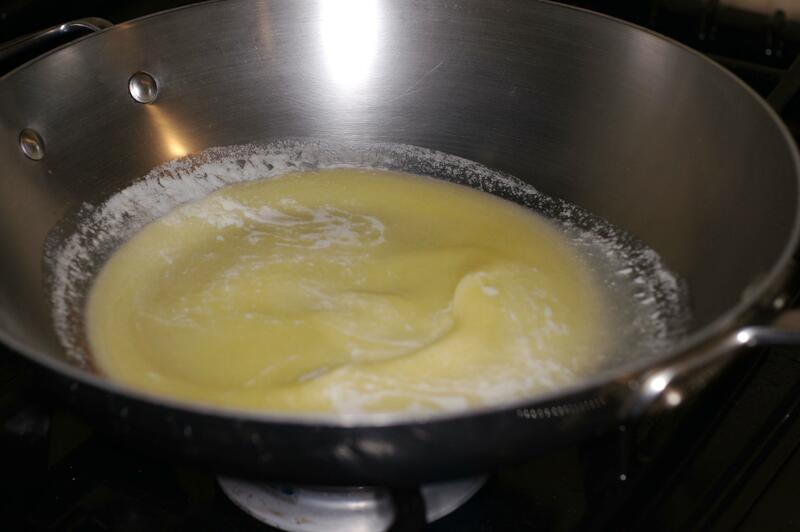 Melt butter in a chef’s pan over low heat. Add all the veggies but the green onions. 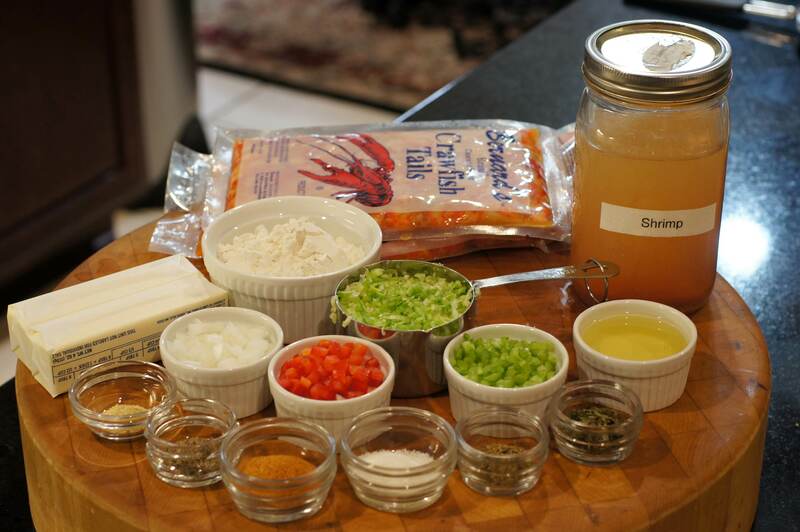 Once the onions have become translucent, add the crawfish tails. Cook over medium/medium-high heat for 3 minutes to heat the tails through. Now add the base sauce. Cook over medium heat for 5 minutes to heat through and enable the flavors to develop. 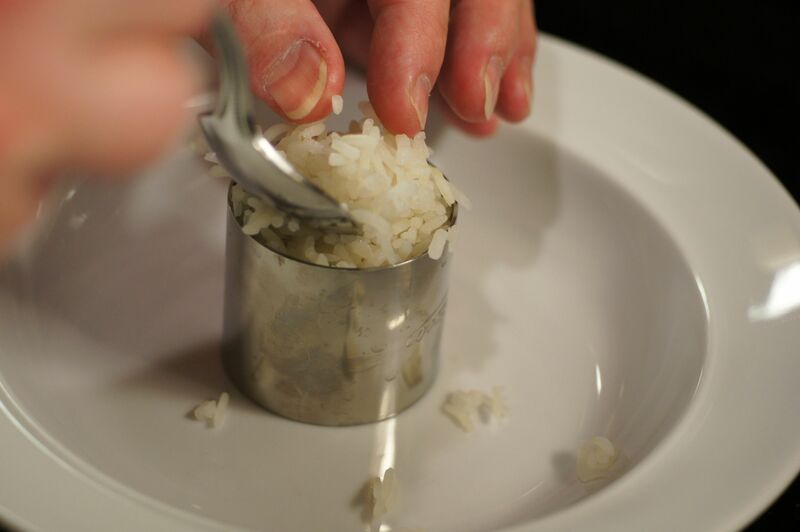 To serve Place a mound of rice in the middle of a bowl. 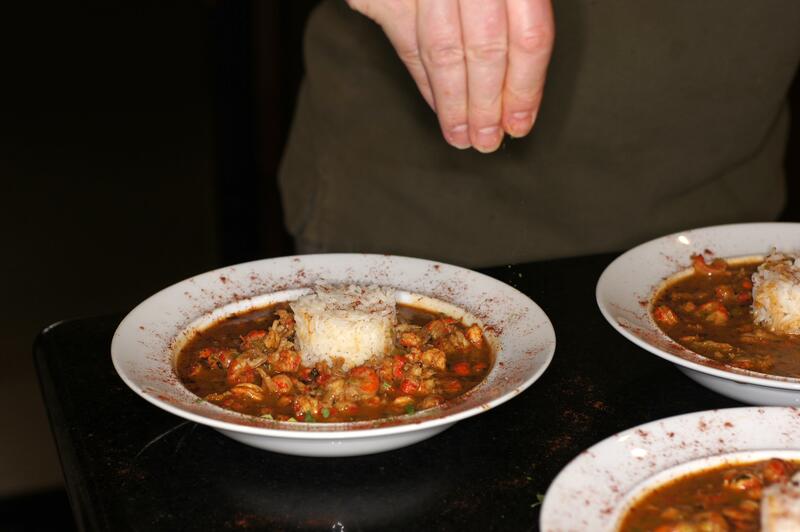 Ladle étouffée around the rice. For pretties, sprinkle cayenne pepper and crushed, dried parsley around the lip of the bowl. NOTES: If you want a little brightness you can add some freshly squeezed lemon either at the time of service or with the base sauce. Also, if you want some more heat add an extra tsp of cayenne pepper. Lastly, some cajuns just can’t live without their hot sauce so make sure you have some Tobasco or Louisiana Hot Sauce on hand. I think this is my favorite post from you. Your roux is perfect. Love the picture. It make my mouth water!! I never knew about place the flour and butter in the oven! Incredible! This is the lazy way of making roux I learned years ago while in Louisiana. 🙂 It makes perfect brown roux every time and you really have to work at it to get it to burn. 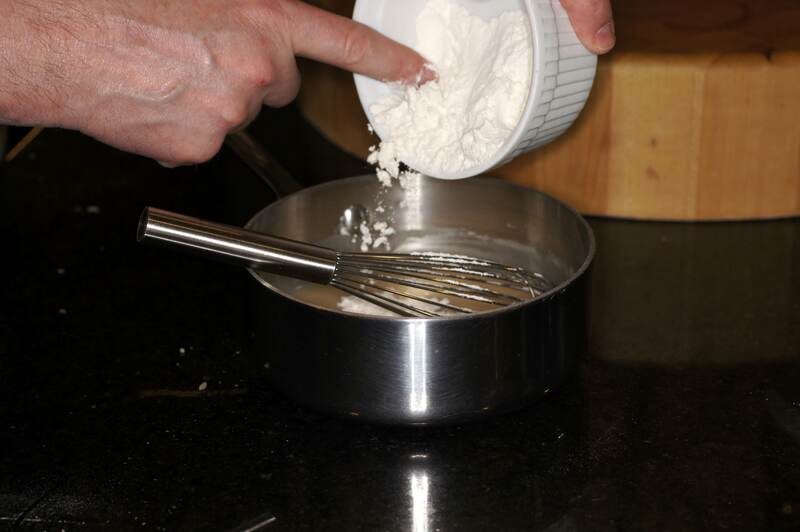 Because the flour is suspended in the oil, the flour heats evenly with the oven heat. There is no more heat on bottom than anywhere else. I stopped whisking over a hot stove at least 30 years ago. 🙂 The only risk you run is that you will forget you just took the sauce pot out of the oven and grab the handle. 😮 Been there, done that and it hurts! 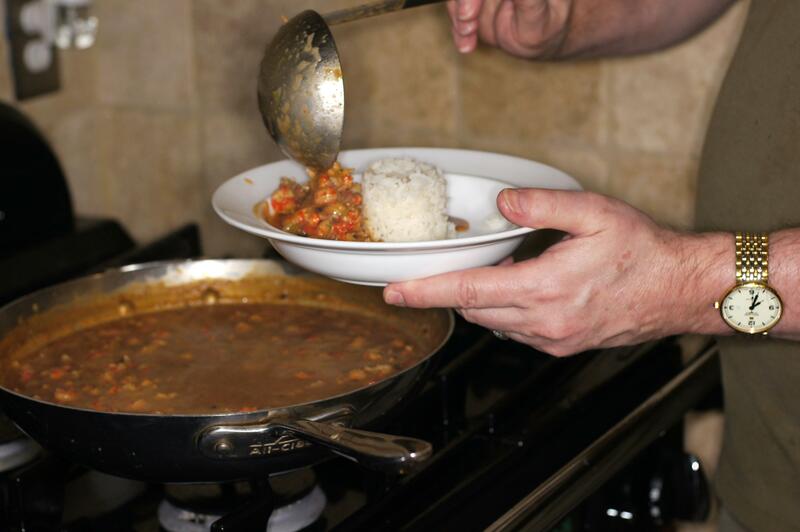 It’s been ages since I’ve enjoyed étouffée, Richard, and your recipe sounds like the real deal. That final shot of yours is the definition of enticing. And I’ve never heard of making a roux in an oven. That is one great tip. Thanks for sharing it and your recipe. Great dish and great technique, Richard. I especially like your way to make a brown roux. Unfortunately we don’t have local crayfish, or at least they are not caught and sold commercially. The ones we do get come from China and taste more of preservatives than of crayfish. I’ll have to look for frozen ones. Hi, Stefan. We’re glad you liked the post. 🙂 I used to spend 1 to 1-1/2 hours relentlessly whisking over a hot stove until somebody showed me this technique. That was 30+ years ago and I haven’t made brown roux the traditional way ever since. 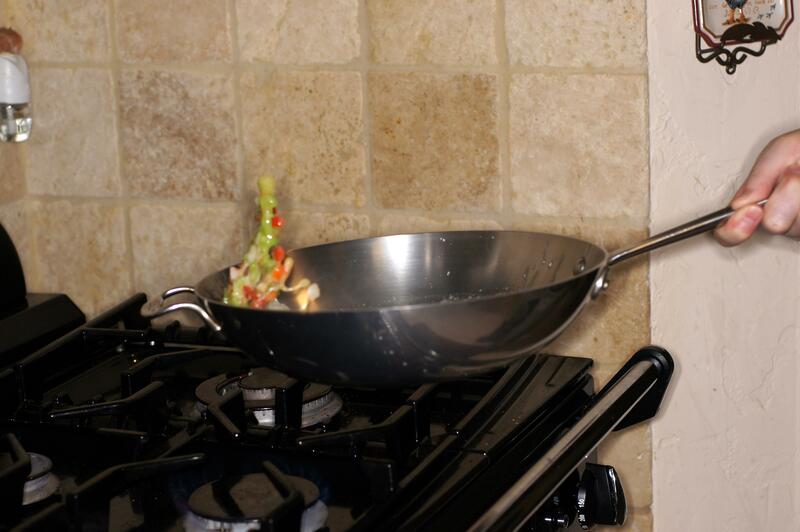 It not only works like a charm, but it saves your arms from whisking and your back from standing in front of the stove. Also, people don’t realize but you can prepare a large batch of roux ahead of time and it keeps in the fridge for up to a month. You just have to bring it out ahead of time to allow it to come to room temperature. Use it rather sparingly because it has a very strong flavor and can overpower food. 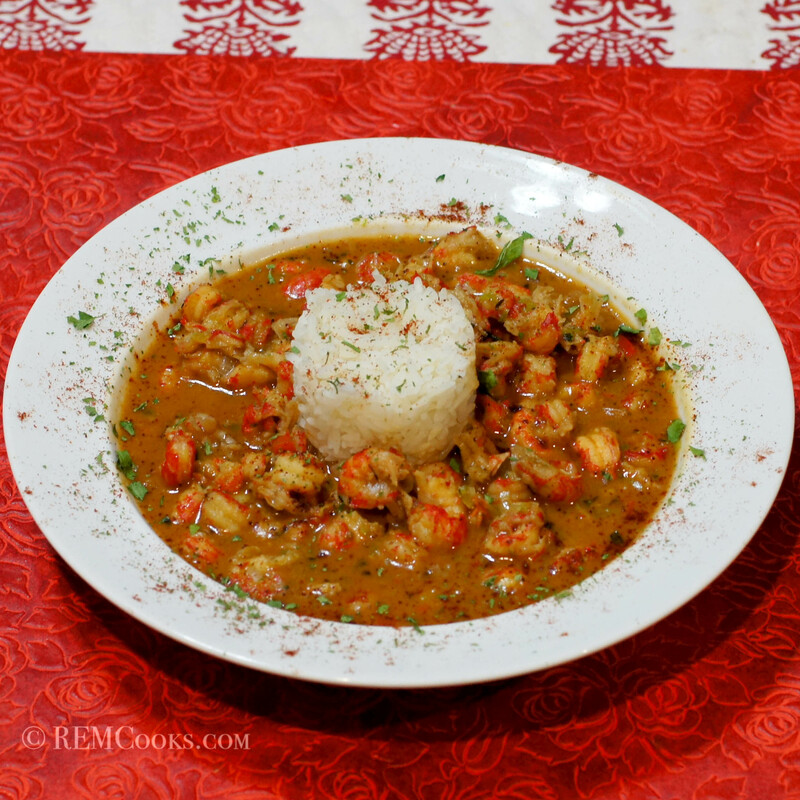 It is a primary ingredient in many cajun foods because they are very bold and spicy. As a result, they are hard to overpower. 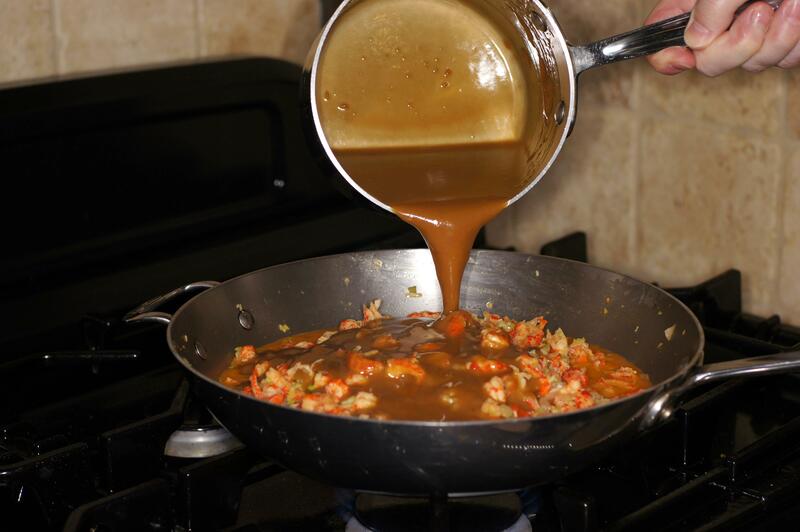 Traditionally, brown roux was used in making espagnole sauce. I generally don’t use it for espagnole sauce preferring instead a lighter roux because, in my opinion, it will overpower the beef flavor. Also, because you have seriously cooked the flour, brown roux has very little thickening ability. That looks amazing. I am bookmarking this with a view to using some scampi I have! Thanks. 🙂 Let us know how you like it. Oh wow, some amazing flavours going on here. Mouth-watering! Do you think it would work with conch meat (there’s a lot of that around these parts and I’m eager to try it in something other than chowder)? Mmm. I can smell and taste it right through my pc screen. Absolutely beautiful! And truly one of my favorite dishes, too. Ah, this looks so delicious! It reminds me of my sweet Grammy too. She always made the best. I wish I was coming over to your place for dinner! That’s a definite yes to those extra lime and chillies flavours! 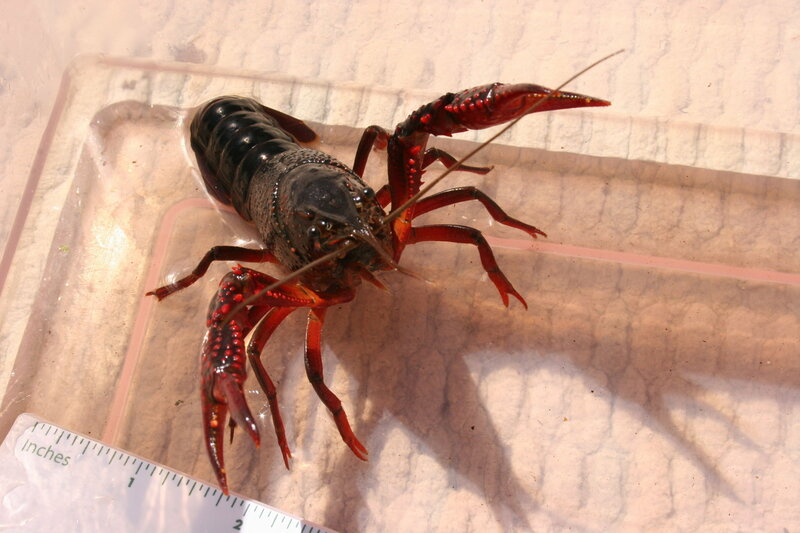 As for the lovely crawfish, we have a similar ingredient called yabbies (same size,) another mud dweller. Delicious and sometimes pricey, (well that’s a lot of shellfish I suppose.) I like a estoufade (which is what we were taught and must similar to your French term for étouffée? Interesting the different translation on a similar type of dish.